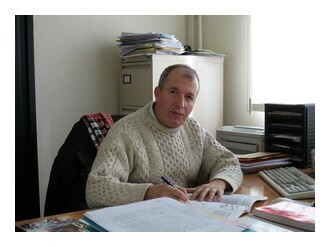 Belkacem Meziane was born in 1951 in Larbâa-Nath-Iraten, Algeria. He received the Diplome d’Etudes Supérieures in solid-state physics from the University of Algiers, Algeria, in 1975, and the M.S degree in Electrical Engineering from the Florida Institute of Technology, Melbourne, in 1978, and the Ph.D. degree and the Habilitation à Diriger des Recherches from ENSSAT, Université de Rennes I, Lannion, France, in 1992 and 1996, respectively. From 1979 to 1990, he was a lecturer with the Physics Department, Université des Sciences et Technologies Houari Boumediène (USTHB), Algiers. In 1986, he was elected Junior Member of the International Centre for Theoretical Physics (ICTP), Trieste, Italy. From 1990 to 1998, he was a member of the Optronics Department at ENSSAT, Université de Rennes I. During his different non-permanent positions at ENSSAT, he participated to the development of various topics in the Laser dynamics issue. These included simple approaches to unstable and chaotic behavior in inhomogeneously broadened laser systems; feedback-induced instabilities in semiconductor lasers; characterization of fiber laser properties, and optimization of an ambulatory sensor system for sleep-stages characterization. In 1999, he obtained a tenure track professorship with the Université d’Artois, Lens, France, to join the physics team of the Laboratoire de Physico-Chimie des Interfaces et Applications where, in addition to the above topics, he has been involved in the understanding and characterization of the optical properties of cholesteric liquid crystals. Proceedings of SPIE Vol. 6997 (SPIE, Bellingham, WA, 2008) 69971M. Proceedings of SPIE Vol. 6997 (SPIE, Bellingham, WA, 2008) 69971E. Proceedings of SPIE Vol. 6997 (SPIE, Bellingham, WA, 2008) 69971D. J. Phys. B: At. Mol. Opt. Phys. 40 (2007) 3343-3355.